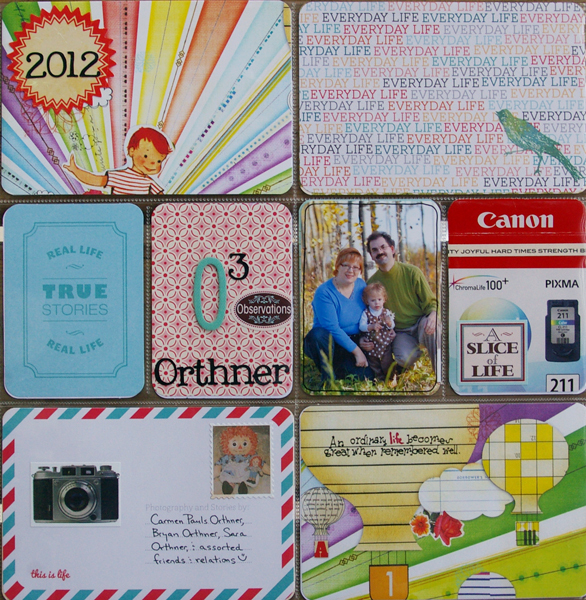 Here is the opening page for volume 1 of my 2012 Project Life album collection. I wanted a playful look for the start of my album, so I cut up a sheet of Sassafrass paper with an explosion of rainbow colours and hot air balloons, and used the pieces to frame the page. I like that the little boy is a redhead, like me (thank you Penny’s Hair Design ), as is, of course, Raggedy Ann on the “postage stamp”. I also wanted my opener to say a few things about what the album would be about — stories that tell the truth of our year in both its good and difficult times (I like how that card from the Clementine collection looks like a bookplate that would be stuck in the front of a book, and the word strip has both “joyful” and “hard times”), about the three of us (thus the “O3″ and the pen-framed photo of us), sent out as a visual “letter” to anyone who cares to read it (the “airmail envelope” card with the camera sticker), full of both photos and memorabilia (like that Canon printer cartridge box). I really believe those words I added to the hot air balloon: “An ordinary life becomes great when remembered well.” And the balloons themselves, lifting up and away, convey a lovely image of being open to possibilities and moving forward, yet going slowly enough to really experience the journey — and, now that I think about, these albums provide the view from high up, allowing for a big picture view of what we’ve been through this year. Carmen this is fantastic!!!! I LOVE how bright and colorful and fun it is and it makes me want to see more!!! 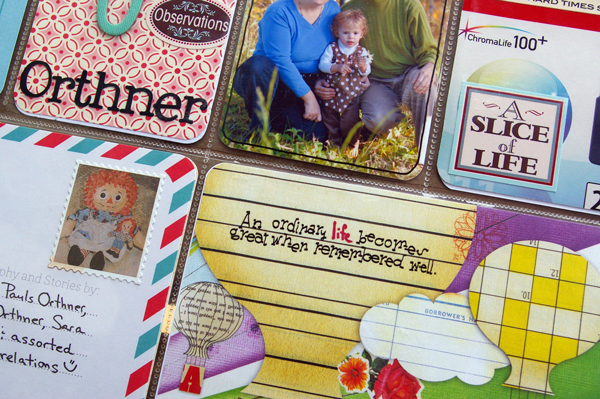 Thank you for joining the Blog Hop this weekend! Carmen, this is a wonderful opening to your Project Life! I love the photos and the colors that you’ve chosen. I’ll be watching with interest as you share more of your album.